"Understanding each stage of a flea's life is the first step in total flea control." If you have a flea problem, you'll want to address the entire flea life cycle and get rid of the pesky parasites in each stage. Ignoring just one stage in your flea control efforts will result in the fleas just starting the cycle all over again. It's estimated that with any flea population, 95% of all these parasites are in a sub-adult stage (i.e., eggs, larvae, or pupa). These sub-adult fleas can lie dormant in your home for several months before they hatch and start the cycle all over again. How Long is the Flea Life Cycle? The whole cycle can be as quick as 20 days or can last up to one full year; this is because the flea may be in a dormant stage for a long time. The cycle can be interrupted at any stage, but some flea control methods are more effective than others depending upon the stage the flea is in. Warm and humid weather will speed up the cycle and contribute to a larger infestation of fleas. The adult female flea lays up to twenty flea eggs at a time (and this can be daily!). The flea egg stage is the beginning stage of the cycle. The flea eggs may be deposited on your cat and in your cat's environment. This includes your cat's sleeping area, your carpet, your furniture, floorboard crevices and other cracks and corners of your home. Eggs can also be deposited in your yard. Use diatomeceous earth to eliminate them in your yard. In addition to attacking your outdoor kitty, fleas deposited outside from other neighborhood animals may afflict your indoor cat. Adult fleas are great little hitchhikers and can jump onto you while you're outside. The flea then jumps off of you and into your house and deposits her eggs! Flea eggs deposited directly onto your cat will usually fall off into your cat's environment fairly soon. Flea control efforts must consider the flea egg stage to be effective. Flea eggs will hatch into larvae 2 to 14 days after being laid. The larvae are small and white. Larvae rely on adult flea excrement for nutrition, so this is a good reason to keep suspected areas where there might be fleas clean. Over the next two weeks to six months, the larvae will molt three times before entering the next stage of the flea life cycle. The flea larvae spin cocoons around themselves in which they move to the last phase of the flea life cycle and become adult fleas. The larvae can remain in the cocoon anywhere from one week to one year. Temperature is one factor that determines how long it will take for the adult flea to emerge from the cocoon. Warm and humid weather speeds the maturation process and the flea life cycle. While in this stage, the larvae are very resistant to chemical insecticides and other environmental treatment methods of flea control. Flea control efforts must consider this aspect of the flea life cycle to be effective. The flea matures in the cocoon and emerges looking for a host to feed on. When the flea finds a host (your cat or kitten-for dog or you! ), it jumps on the host and holds on with six hooked legs. It then uses its sharp mouth parts to cut a hole and insert its feeding tube into the host. After a blood feast, the parasite lays its eggs and the cycle starts all over again. Amazingly, an average adult flea can live without food for up to 58 days! Fleas spend most of their lives off of your cat and in his or her environment; so just because you don't see a flea on your cat, don't give up on your flea eradication efforts, especially if you see other evidence of fleas. For example, tiny black flecks of flea dirt (excrement) will be left behind after a flea has fed on your cat. When choosing a flea control method, all stages of a flea's life must be considered. To get rid of fleas, you must choose one or more methods that are effective in all four phases of the flea life cycle. 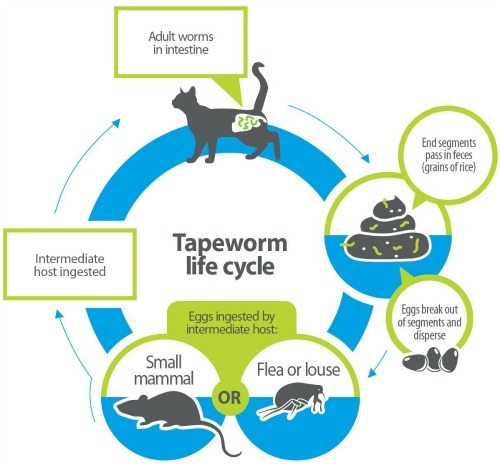 Program® (lufenuron) prevents eggs and larvae from developing, so this is a great way to effectively eradicate this parasite. Advantage for cats kills all life stages; so if you want to get rid of some adults right away, you may want to use this medication. Whichever you choose, be sure to get the right dosage depending upon the size of your kitty (and only use the medication for cats and not for dogs - unless you're using it for your dog, of course!). Consult with your trusted veterinarian for the best choice for your kitty. Natural Flea Control Methods - More safe and alternative methods to eliminate fleas. Amazon carries all the popular conventional flea control medications you can get over the counter. Their prices are usually the lowest around. Only Natural Pet Store has the best selection of natural flea control products and, in my opinion, the best customer service on the internet.